Posted on July 30, 2014, in Indie Games and tagged import, japan, localization, mmo, nintendo, rpg, square enix, video games, wii, wii u. Bookmark the permalink. 24 Comments. I’m less concerned with Dragon Quest VII considering it’s already been playable on the PS1, though I would totally buy the remake on the 3DS. But good. I’m glad there’s a petition out there and i was hoping that this post would get this kind of reaction. You’re like me, I’m not really as concerned with Dragon Quest VII, but I’ve never played the original on PS1. However, if they did come out with it for the 3DS I would definitely buy it. 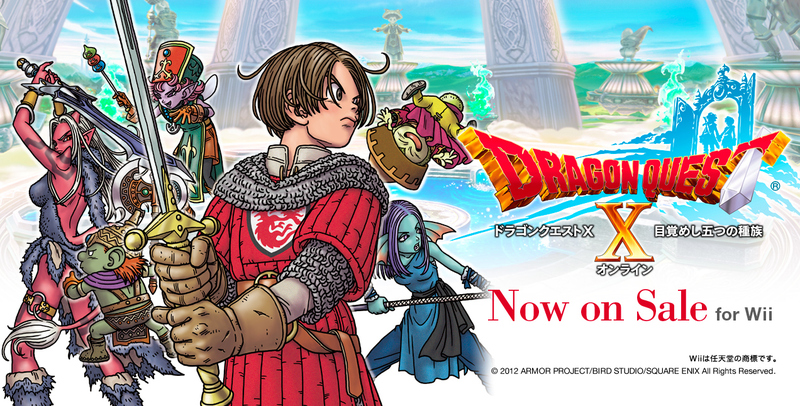 Dragon Quest X is what I really want though. I was a huge fan of FFXI and played for about 7 years and everything that I’ve seen and read about Dragon Quest X reminds me heavily of it. I don’t understand why people are so adamant about not paying monthly for a game when it clearly is amazing and has an immense amount of things to do and people to meet. I hope you went to their facebook page I posted below and signed the petition. Yup. Way ahead of you on that. And I understand arguments for not wanting to pay a monthly fee. I get it. You bought the game, you don’t want to have to keep paying for it to pay it. But my argument is, a $15 a month fee is a lot less than buying 2 or 3 more games every month. If you’re engrossed enough in an MMO, then you don’t have time to play those other games and essentially will be paying less money by just paying for that one fee. Apparently it didn’t like the link… So try this one. Also they’ve been backed by Operation Rainfall to hopefully bring both of these titles to their rightful place here in North America. Apparently it didn’t like the link. Try the one below. Also they’ve been backed by Operation Rainfall to hopefully bring these titles to their rightful place in North America. They also provide a link to download the PC copy of the game which I plan to do tomorrow to play the free trial despite it being in Japanese. If you decide to create a character as well let me know what server / character name you make and we can hit up some adventuring. I sat there for like an hour trying to figure out how to download the PC version. I know zero Japanese. The Operation Hero facebook page just released a step-by-step guide how to download and play the game. Going to do this tonight after work. holy assholes that was annoying. well I made an account and logged in. It was such a friggin headache but I got it! Awesome man, glad to hear it. I downloaded the client/updated it and I’m making a Yahoo Japan account as I type this. Did you have to select a specific server or after you log in you pretty much create a character and it signs you into a server everyone is on? Got everything setup and my character created. It appears that the first few hours are spent offline introducing you to the game. Eventually when progressing through the story you’ll get to a point where you can pick your online race and starting job. If you need help with the setup or have any questions let me know. Just like when you registered your Yahoo! Japan account with Square-Enix. Go back to the icon in the lower left corner of the launcher, select Yahoo! Japan ID, enter your login, and it will add a Yahoo! Server to the server list on the left of the game launcher. Select that server instead (you may need to enter Yahoo! Japan ID and password again) and once you do it should then log you in to create your Offline Human character and sibling. Once you go through the Offline portion of the story you’ll eventually be able to select your Online character race and starting job. The jobs selectable are: Warrior, Thief, Martial Artist, Priest, Mage and Minstrel. Hey man, you ever get a chance to play? The game is super fun and totally reminds me of FFXI. I currently have a Lv. 27 Weddie Thief and usually select the first server that shows up in the list. If you ever want to exp/quest online let me know. Ah, that’s a shame man. You’re at the last point of just getting the Yahoo! Japan Server added to the list and once you do you’re good to go. Since you already registered your Yahoo! Japan ID all you have to do is select the icon in the lower left hand corner again (like you did when you registered your account) and select Yahoo! Japan ID, it will have you log in and then it will add the server to your list to begin your adventure in Offline Mode as a Human character you create. I can help you through it if you express any interest doing so. I’ll try and do it myself today and if successful provide instruction doing so. Also it appears that they’ve begun IP blocking Dragon Quest X again since I can no longer play my Weddie Thief. Wish you got a chance to play man, it was a great experience. Well good luck to you sir. If you require any assistance please feel free to let me know.